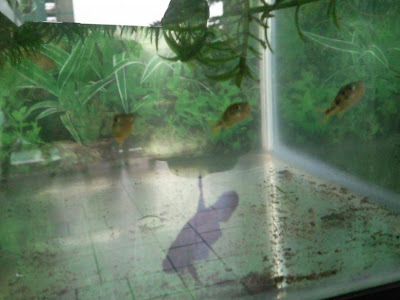 i have been keeping dwarf puffers at my outdoor fish tanks for sometime. just bough 3 from C328 at $0.90 each. Feed them tubifex worms they dun recognise its food. The packet of snails sold at C328 always sold out! Where can we get or cultivate water snails to feed the puffers? bro i bought a packet of soil at kovan, the soil contain snails egg because when i pour into water few days later, the water full of snails. btw the packet soil cost one purple note only. Where Kovan lfs, izzit hougang area? The brand of the soil u have the picture? I think u just need a spare tank, put some cheap plants, a small sponge filter, snails and feed. U can probably get a small colony of them soon. Used to have a snail tank. They laid some eggs and I have no idea why they died one by one. It's like the whole shell will be empty. Anyway, failed breeding them. Haha. You can just feed them algae wafers or some vege. I threw in some cucumbers. yea it is hougang area. haha it is not lfs actually is flower shop selling those soil to plant lotus one. isn't 50 is blue? hahahha. Hardic, maybe yours a good idea! cheap plants have snails u mean? Snails bought from C328 , breeding them first. Now the 3 puffers finally start to feed on tubifex worms first. 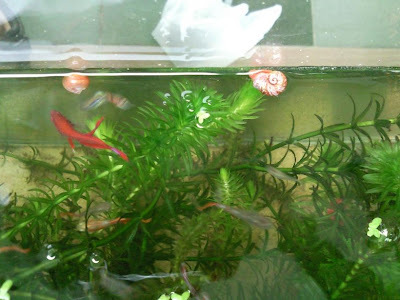 I also bought some snails from C328 yesterday, put them in a tank without puffers (the green generals). Hoping to breed the snails first.